Below are the complete details of the Consultants jobs in Primary & Secondary Healthcare Department in Lahore. Skills Required for Job: Candidates must have Good Communication Skills. Good Team Working Skills. Candidates must have Good Communication Skills. Good Team Working Skills. Qualification: Primary & Secondary Healthcare Department Lahore Jobs For Consultants M.Com / MBA ACCA Degree Holder, with minimum 3 year experience in relevant field its a permanent based jobs, the late date of submission application 28 January 2019. 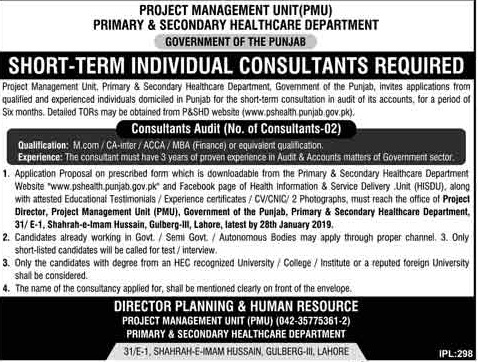 Consultants jobs in Primary & Secondary Healthcare Department Lahore, in Pakistan published on Paperpk.com from newspaper on January 12,2019. Job seekers who are already working as can also apply for post of Consultants.